Sprung steel band that has been bent with the gold-covered ends overlapping each other to form an 'X'. 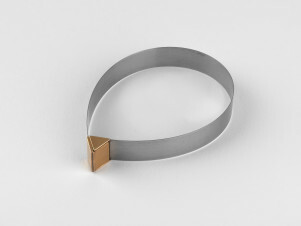 The gold catch is fabricated of two interlocking square pieces on either side of the steel band. The gap between the top and bottom layers accomodates the sprung steel. The gold section and steel strip are drilled and riveted together. 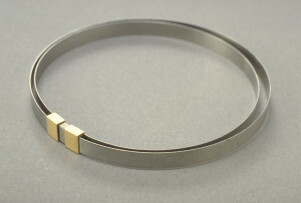 Bracelet, Elisabeth Holder, 1980, Crafts Council Collection: J145.